that a lot of houses have these days. I wanted to do the same thing. This is the only picture I can get of this space. with no windows and a center light. We rent - we deal with it. Anyway, this shows the space I am referring to. all you see is a very long blank space. being on a budget was limiting what I could use. You know me and how I love paint by now. If it doesn't move - it gets painted. along with a few other interesting things I intend to use for the other side. 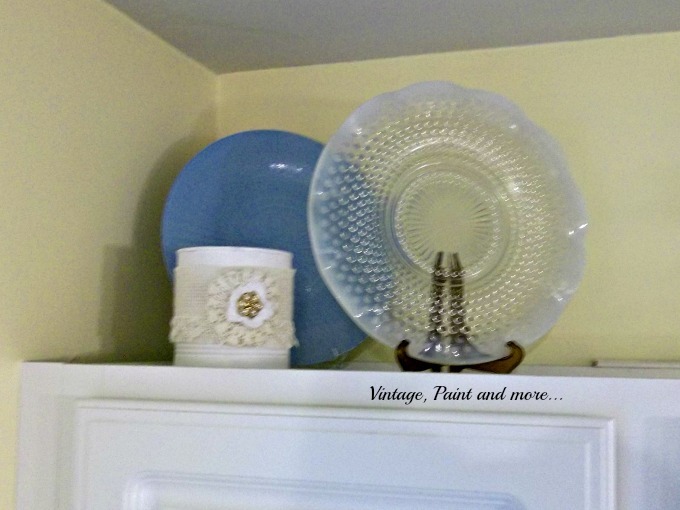 The white plate I stenciled with a flower stencil that I picked up at Wal-Mart. then I outlined the graphics with a black sharpie. to make them stand out more and add to the overall design. 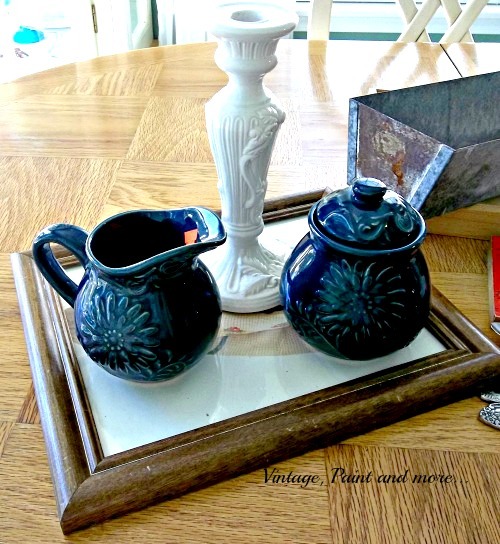 The sugar bowl and creamer from the thrift store got a coat of blue spray paint. even though it is still dark. ( I use a point and shoot camera). on top of a spray painted candlestick so it could be seen better. I love this little vignette. It is so cheery and really brightens this otherwise dark corner. just gave them a coat of blue spray paint. 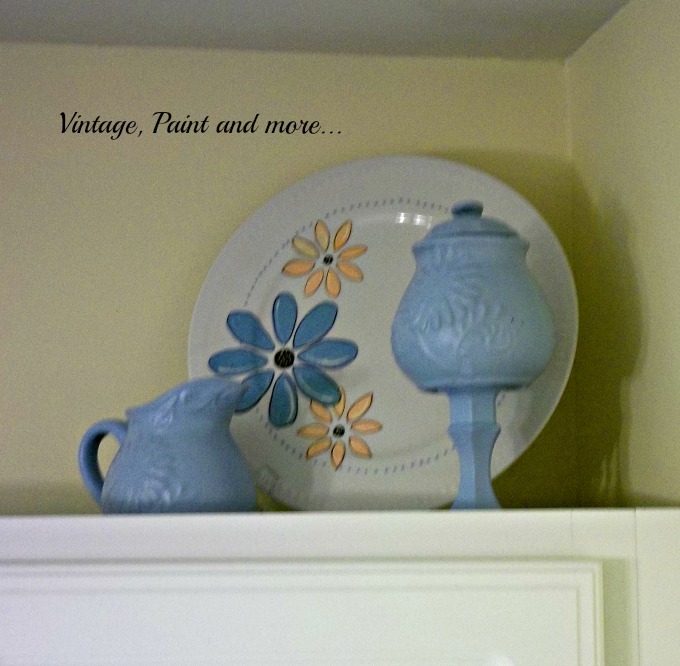 These plates had a cut design in them and really stood out when painted. I used the same technique as my painted vases. 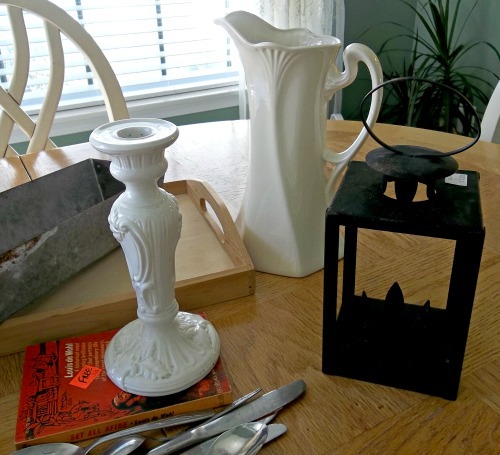 (This vignette was done on the dining table to give you a better idea of how it looks. then our initial was done with chalk. so getting a halfway decent picture was not possible. 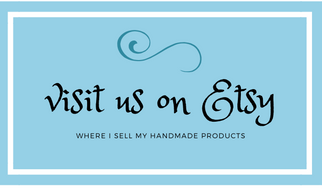 I already had all the craft supplies left over from other projects. NOTE: These plates are meant to be used strictly as decorative items and are not intended to hold food meant for consumpion. I would love to hear about it in the comments. 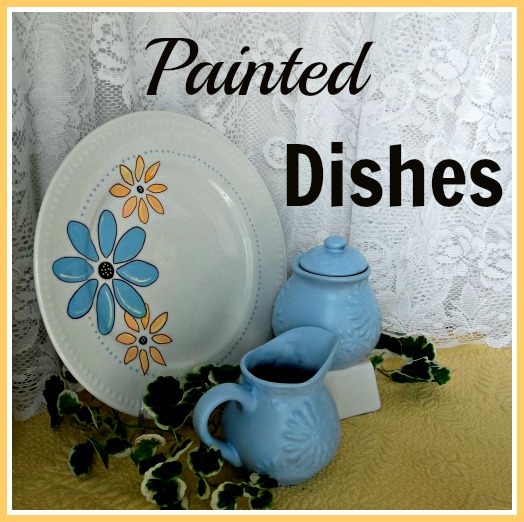 Your painted dishes look lovely!!! I really like the ones with the flowers. And the baby blue is a great color too! That is such a great idea. It would take forever and a day trying to find the 'perfect dishes' at the thrift stores. This is so much easier! 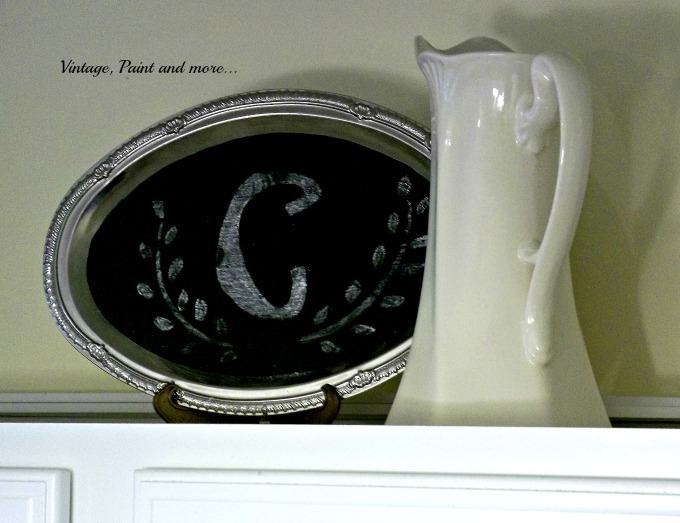 The stenciled plate is darling and perfect decor for the season! Such great ideas for so little! It looks wonderful! Thank you for sharing at What We Accomplished Wednesdays. Have a great weekend! Cathy I love the vignette you created. 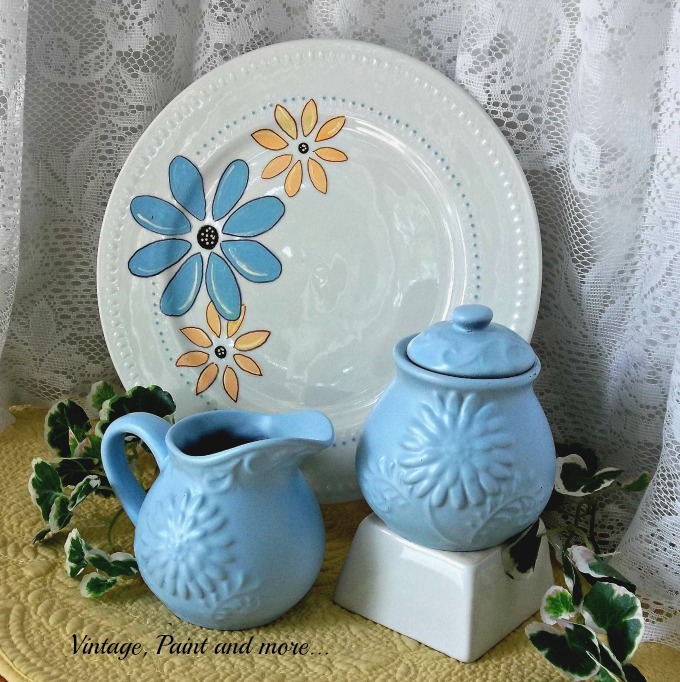 The cream and sugar bowls look so fresh painted blue but it was that pretty painted plate that caught my eye at the Share Your Cup Thursday Party. Very Nice! Hi Kathy! What fun you must have had planning and putting this all together :) I absolutely love the plate you painted with the flowers; it's so special (everything is, really). Love the chalkboard too. You, my dear friend, are a genius! I love every stinkin' bit of it! So clever and so pretty is the flower on the plate! These pieces all look amazing!! I'm a sucker for pitchers,and teapots, and I'm really jealous of yours!! 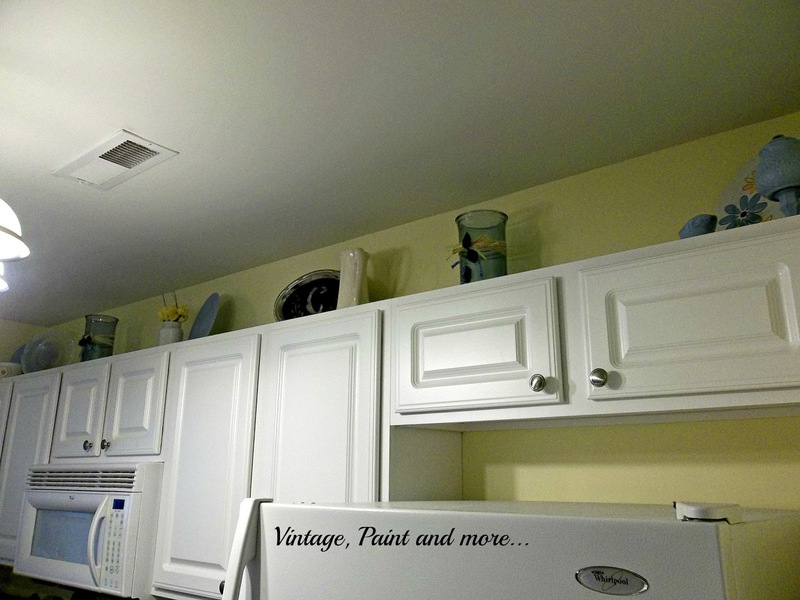 I too have the space above my kitchen cabinets, and have had a hard time decorating up there. Thanks for the inspiration!! I couldn't live without my sharpies lol - I even use them on my furniture makeovers - but never thought to do it on dishes ! Great job Cathy. 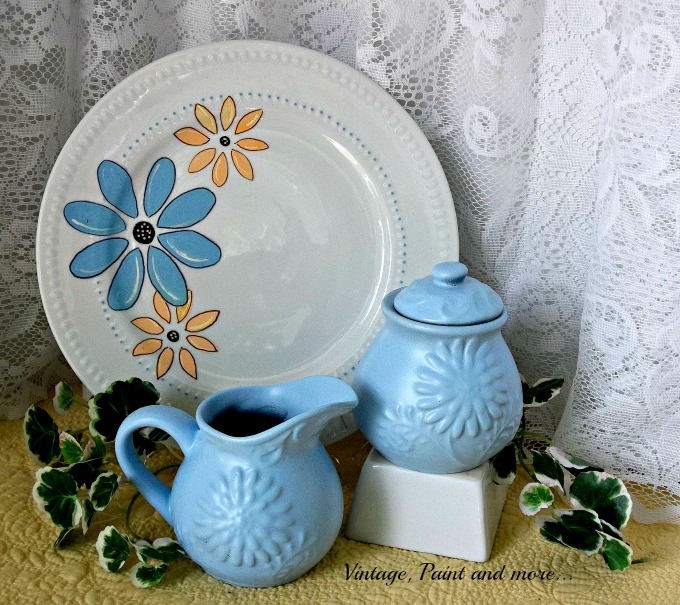 Love the stenciled plate! I have a bird theme going on top of my cabinets. 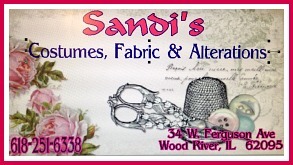 Helps tie in my rolled curtain that I made out of bird fabric over my corner kitchen window. Thanks for sharing with SYC. Such a cute look! 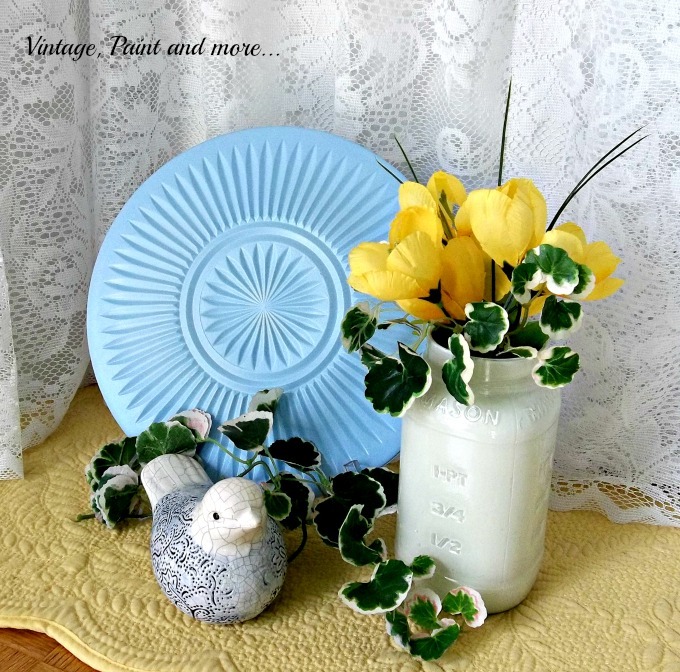 Thanks for linking with Home Sweet Home! This post must have been about the time I was going crazy with a baby shower and high school reunion. I missed out on lots of blog posts that week. 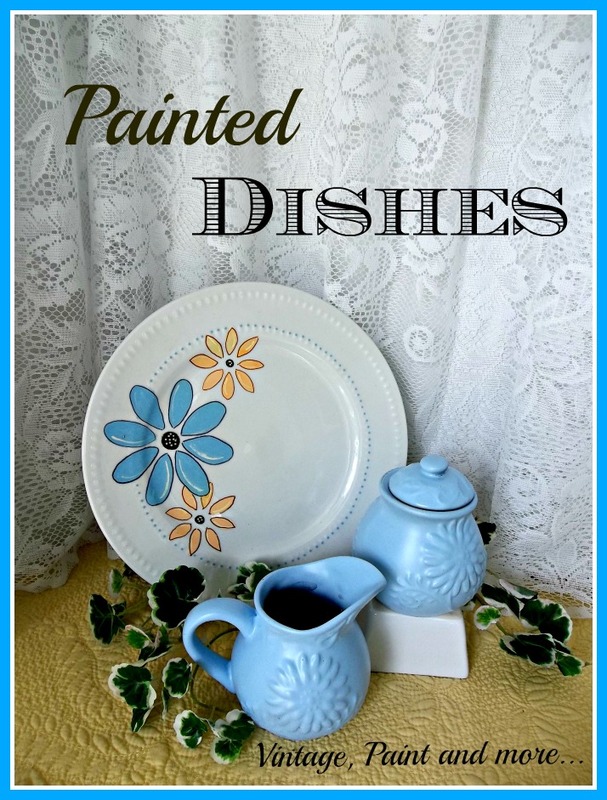 I love the painted dishes and might just try some myself.